Arrival to Bucharest Coanda Airport, meet and greet by your tour guide (to wait with a name sign right after you exit Customs). Transfer to Bucharest. Hotel check in with the evening at lesiure. 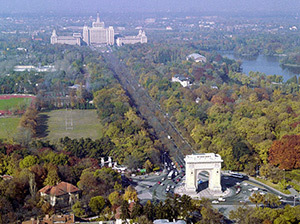 Bucharest – the capital of Romania. Hot and cold buffet breakfast at hotel. Take a city tour of Bucharest with the Revolution Square, Cotroceni Quarter for its representative architecture, a visit of the Palace of the Parlament and the main avenues. Then leave Bucharest for a drive north to Bucovina. In the town of Campulung enjoy an exclusively organized interactive egg-painting demonstration by a local artist in her home, this being one of the main local traditions of the area. You will also have the chance to admire painted eggs from all over the world in an unique private collection. Enjoy a home hosted dinner in the village, a cultural interchange. After arriving in Gura Humorului, check into the hotel. Evening at leisure. A la carte breakfast at hotel. Bucovina monasteries are gems of medieval Moldavian architecture and artistry. Begin your day with Voronet, the most famous out of all, known as the Sistine Chapel of the East and featuring one the best preserved Last Judgment fresco in this part of the World. Next is Moldovita Monastery where the UNESCO Golden Apple Award given to the painted churches in 1975, is kept. Later continue to the nearby Sucevita Monastery, which is the largest of all, looking more like a mighty fortress than a monastery. The Ladder of John of Sinai is considered one of the best of the frescoes of Sucevita, rarely present in medieval Romanian art. 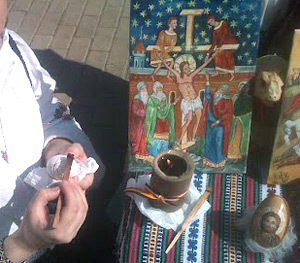 Visit the small museum of this monastery displaying some of the most valuable old Bibles in the country. In the village of Marginea visit the black pottery workshop – they use a technique called “oxygen reduction”, there is the same technique in Mexico only! End your day with the Monastery of Humor, the only one without a belfry tower. Return to the hotel. After breakfast depart early. Journey west over the picturesque Oriental Carpathians and reach the splendid region of Maramures (northern Transylvania). Due to the relative isolation of their land, the people of Maramures developed a particularly strong community, with a unique personality, traditions, culture, fashion and lifestyle unspoiled for centuries. It is like a trip back in time. The first visit on the Iza Valley is in the village of Dragomiresti at this 235 year old original complete household. The visit the wooden church of Ieud (UNESCO World Heritage Site) and the oldest in the area. Stop in the village of Barsana for an exclusive visit to the workshop of Toader Barsan, a famous master carver. He represented Romania in the 1999 Smithsonian World Festival in Washington, DC. Tour the famous Merry Cemetery in the village of Sapinta. 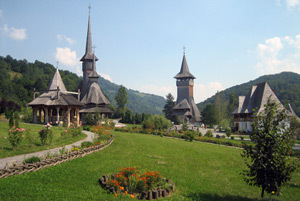 Later, make a quick stop to the exquisite Barsana Monastery, a great example of Maramures wooden church architecture. In the town of Sighet visit the Anti Communist Memorial, a political prison in Communist times and along with Auschwitz and the Normandy Memorial, one of the three main sites of this type on the continent. Enjoy a home hosted accommodation in the village of Iza (modern villa with all facilities) as well as a home hosted dinner where our hosts will join. (This is not a bed& breakfast experience but a real home). After breakfast drive south to Cluj Napoca, the capital of Transylvania and one of the important university centers of the country. The panoramic city tour will include St Michael’s Cathedral, the Fellner & Helmer Opera House as well as the City Hall and Old Center. In the afternoon visit the impressive Turda Salt Mines, recently re opened to all modern facilities. Late afternoon arrival to Sibiu. Take a brief orientation tour on the way to the hotel. Overnight in Sibiu’s famous Romans’ Emperor Hotel, first built at the end of the 18th century. Dinner on own. 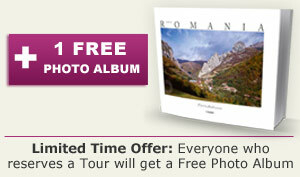 Suggested is Crama Sibiul Vechi, best cellar – restaurants in town, serving Transylvanian fares. Hotel Imparatul Romanilor, located in the old part of Sibiu near the main square, in a 16th century building built in traditional Transylvanian Renaissance style, a former merchant’s hall transformed into hotel in the 18th century, with many famous guests: Emperor Franz Joseph II, composers Franz Liszt, Johann Strauss as well as Prince Charles and many others. Hot and cold buffet breakfast at hotel. Start your day with a leisurely walking tour of Sibiu, the chief city of the Transylvanian Germans. One of the landmarks of Sibiu is the Bruckenthal Museum assembled by Baron Bruckenthal, Governor of Transylvania at the beginning of the 19th century and the second museum to ever open in Europe. Next is the Evangelical Cathedral completed in its actual shape in 1520, but inside there is an exquisite fresco of the Crucifixion on the north wall of the choir dating from 1445. The tour ends with the original Pharmacy Museum located in a 15 century pharmacy. Drive to Sighisoara via fortified church of Biertan, a World Heritage Site for a visit of the former Seat of the Lutheran Bishops. Before starting your walking tour of old Sighisoara attend an exclusive lecture on Vlad the Impaler – Dracula, what is truth and what is fiction. Sighisoara is one of a kind. It was developed by the German settlers as of late 12th century. It stands on a network of tunnels and catacombs and, according to one version of the myth; this is where the Pied Piper brought the children of Hamelin after their ungrateful parents refused to pay him his due. Your walking tour includes the two squares of the Citadel (Upper Town), the Scholars’ Staircase, the House with Antler, the Tower with Clock (climb up for a great view), the Torture Chamber and the Weapon Museum. 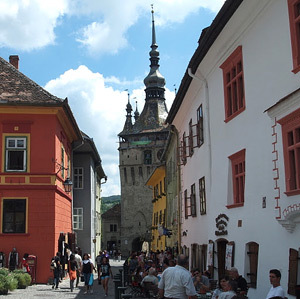 Sighisoara is the place where the Vlad the Impaler Dracula was born in 1431. The Birthplace is one of the main tourist attractions. The rest of the day is at leisure in the lovely Upper Town. Bran Castle – Dracula’s Castle. Hot and cold buffet breakfast at hotel. Leave Sighisoara in the morning. Journey south through the picturesque Transylvanian Plateau for a tour of Brasov to admire the 14th century Black Church with its 4,000 pipe organ and over a hundred Anatolian prayer rugs given to the church as gifts by the rich Brasov merchants. 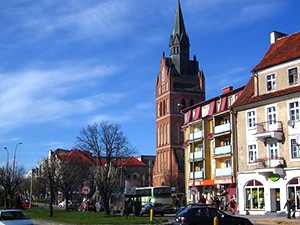 Visit Schei District. 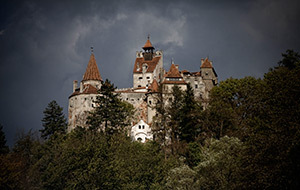 The attraction of the day is Bran Castle also known as Dracula Castle. The castle was built in 1377 to safeguard the trading route between Transylvania and Wallachia, enlarged and restored a few times to become a royal residence in the 1920s. Afternoon arrival to Sinaia mountain resort. Named after St. Catherine Monastery on Mount Sinai, Sinaia became the unofficial capital of the Kingdom of Romania towards the end of the 19th century. Orientation tour of the resort including a view of the famous Casino, inspired by the one in Monte Carlo. Evening at leisure. 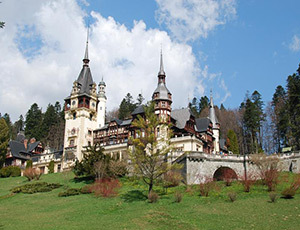 Peles Castle, the most famous royal residence in Romania. Hot and cold buffet breakfast at hotel. In the morning take a guided tour of the Peles Castle and Gardens in Sinaia, the royal residence of King Charles I of Romania and known as one of the most beautiful summer royal residences in Europe. After the visit transfer to Bucharest Coanda Airport in time for your return flight. Note: For a morning departure the program will be adjusted to spend the last night in Bucharest. The trip was just fabulous. Everything was the way it was supposed to be or better. We had the best tour guide in the world I feel very fortunate to have had George as our tour guide. He was very friendly, knowledgeable, organized and made things go very smoothly. We loved all his stories about the Revolution and Communist times. 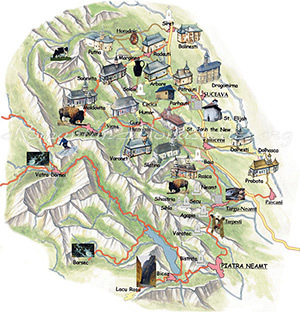 Our journey through your wonderful country was most enjoyable and rewarding. We thank you very much for the help you extended to us especially in customizing our tour. Our guide was a very intelligent, knowledgeable and amiable young man who contributed greatly to our sense of comfort and security. His interest and skills in photography were an additional and unexpected help. He certainly can be considered a very valuable professional. Best Regards! My husband and I visited Romania after we e-mailed about 7 tour operators with the same request (dates, itinerary, etc). We made our decision based on the timely replies, the tour that was presented by each operator, the costs and the manner in which it was presented. There was something different about their responses and we felt good about our decision….we were not disappointed. The accommodations were superb, better than what we would have chosen. 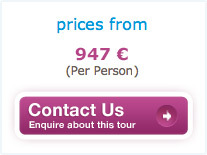 We compared the costs with the other operators and agreed that was the best deal. Once again, I wish to say Thank You for making our trip to Romania (home) so wonderful – everyone was very pleased with the tour and all had a great time. There were many sad tears when we said good bye to each other – no one wanted the tour to end. I am very happy to have contacted you to do this family tour for us – it was EXCELLENT!!!!! After watching you on the Travel Channel we decided to visit Romania. We finally made the trip 14 months later and would like to again thank you for a wonderful experience. It truly was a great trip and we would like to return some day. We kept talking about it for weeks and sent pictures to all our friends and family. We felt fortunate to have you as our tour designer and tour guide and realized as we moved, how good you are at it. Thank you for everything. Took a while before we got back to our normal lifes at home. Just wanted to touch base and thank you for the best tour ever. Romania is a beautiful country and we were happy to get to know people. The cooking lesson in Bucavinia was the best. Where do you find these people. We had a great time all along. Thank you. Thank you very much for the most memorable trip you put together for us. We all enjoyed the experience of finding one of our relatives as well a seeing all of the sites and places within Romania you coordinated for our trip. Cristian was everything we could ask for in a guide/driver, he most definitely made our time in Romania interesting and entertaining, he fit right in and became one of the family. Romania is a wonderful inviting country with so much to offer, I know some if not all of us will return. We are back home, and I think I have finally gotten my sleep cycle straightened out! I just wanted to say thank you for putting together a wonderful tour! The tour was thoughtful, insightful and well pallend and organized The guide you have assigned, Andrei, was very knowledgeable, fun and accommodating. He was also a very experinced driver. Very well chosen hotels all along. 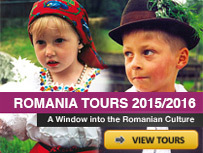 We now have a better understanding of the culture and history of Romania. Thanks again, and I wish you all the best. We were very pleased with our tour of Romania. The “Romania Tours” program was very well planned, and we were very glad that we could be flexible and make changes at any time. We did make adjustments so that we could add other things, or spend more time somewhere, or visit a relative or two as we went along. Dan was an excellent guide and driver for us. All three of us had the highest opinion of his work -no negatives at all. He is good natured and very flexible. He did a great job of balancing the interests and abilities of all of us. We enjoyed his sense of humor and patience. September was a great time to visit Romania. We liked seeing all of the harvest work and the weather was comfortable. The people in the countryside were extremely friendly and we enjoyed the food. We took tons of photos and will have lots of good memories of our visit. Thank you. Hi – You’re quite right about how much we really enjoyed our trip. In terms of our guide, he was fantastic. Very, very accommodating and knowledgeable. He knew when to get us to certain places so that we didn’t miss seeing things. At the same time he certainly gave me a plenty of time to take pictures without being rushed. In fact, he was able to give me some good suggestions in terms of places, etc. All in all, I’d highly recommend him to anyone else wanting a guide in Romania. Thank you for the wonderful adventure you planned for us. “We started in Romania and spent 6 days traveling around the country. We arrived in Bucharest early evening, stayed one night at the Hilton and got a good night’s sleep. That did the trick as we were ready to go early the next morning. We arranged for a driver guide to take us throughout the country as we didn’t want to hassle with trying to drive ourselves. Based on the advice from several Fodorites, we worked with Andrei Nicolau Miclea in Bucharest and he was fantastic – easy to work with, very responsive and very reasonable. Before heading out of town, our guide took us on a city tour of Bucharest. We were surprised by the amazing architecture, especially in the older sections of the city. We went on a tour of Ceausescu’s Palace which was not finished before his death. It is a huge building that is now the Senate and Administrative building. We then headed out of town to get to Sinaia before late afternoon so that we could tour Peles Palace. The landscape was beautiful as was the Palace. There was a new hotel, International Hotel, where we stayed and it was quite nice. On our way back to our hotel we stopped at Orthodox Monastery that was very interesting. It was the first Orthodox Monastery we visited. The next day we visited several places in Transylvania. Our first stop was the Bran (Dracula’s) Castle. It was fun and interesting actually seeing and touring a structure that has so much lore attached to it. Our guide gave us an official “lecture” on the folklore associated with Dracula along with the truths. We saw many horse carts through the country, but especially in this area. Next stop was Brasov where we saw the old town that had houses in the German style and the Black Church that has a large collection of Persian rugs. We ended the day in Sighisoara, which is a world heritage site due to the upper town medieval citadel. We spent two nights in the upper town and thoroughly enjoyed it. It was enjoyable to just sit around the square and enjoy the sights around us. The area was very manageable to walk around. This was one of our favorite spots. One evening, we ate dinner at Dracula’s birth place. And, of course, we felt that it was only fitting to have a glass of “Vampire” wine while in Transylvania! The next day we toured the area and stopped to photograph a gypsy market where they were selling/trading pigs and horses. It was fascinating. Most were in horse carts with wagons for the pigs, etc., but one of the most interesting sites was a Mercedes pulling a cart filled with pigs. We also visited some interesting churches and towns in the area. I really enjoyed just driving through the country away from the main roads to see farmers using horses and wooden plows to till the soil. The next day we headed to the northeastern part of the country to an area where they have painted Monasteries. I’d never seen anything like this. There are as many frescoes painted on the outside of the churches as the inside. It was amazing. We stayed at a new Best Western Hotel in this area which was quite nice and comfortable. On our final day of touring we headed back to Bucharest for a farewell dinner and cultural performance. We thoroughly enjoyed our time in Romania and were surprised at the many sites that we were not expecting. We covered a lot of ground in 6 days and were grateful that we didn’t have to do any of the driving. I’m not a very adventurous eater, but I was always able to find something I liked. The salads were amazing. The lettuce/tomatoes tasted like it has just been picked in the garden. There were times when we just wanted a quick sandwich for lunch. We found that there were many gas stations that had “fast food” restaurants which served pre-made sandwiches which really hit the spot. We much preferred this to sitting in a restaurant for an hour or more. We flew to Krakow the next morning.